From Ollantaytambo to the rainbow mountains of Palcoyo, journey through the most beautiful sights in Cusco! 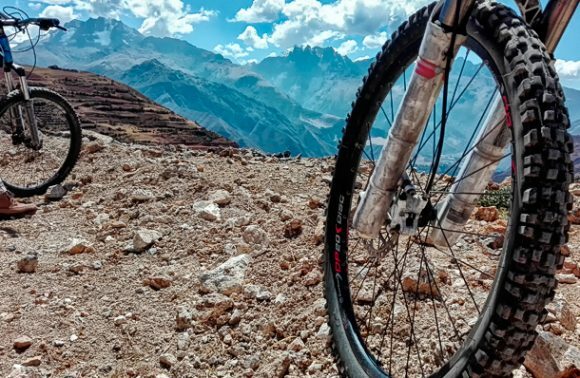 9 Days of alternative, crowd-free trails in the Andes and the Jungle! With 9 days in Cusco, you can experience the best hidden gems in the region. This exciting tour offers alternative hiking routes in both the Peruvian Andes and jungle regions of Cusco. Visit the bustling, remote town of Ollantaytambo before heading into the Sacred Valley to explore ancient Inca ruins. Immerse yourself in local life at the Patacancha valley, before trekking up to one of the seven wonders of the world, Machu Picchu. Then, challenge yourself to an exhilarating hike up the colorful Polcoyo — a lesser known, but equally rainbow mountain range — and discover eye-candy sights at the top. 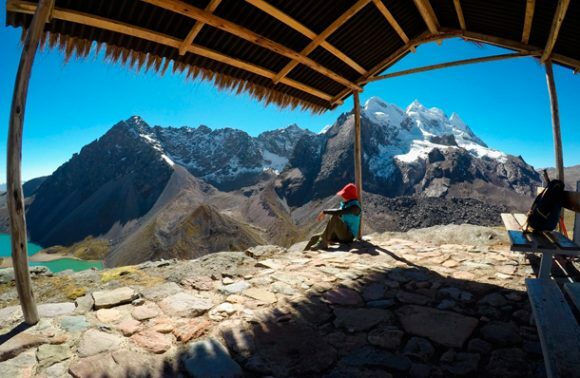 Combining the experiences of sharing a homestay with a local family, camping high up in one of the world´s most beautiful mountain ranges, exploring diverse landscapes with chances to spot Peruvian wildlife, this tour is recommended for anyone with an adventurous soul and the desire to see Peru off the beaten track! Enjoy a day of leisure in the fascinating city that is Cusco! It is important to acclimatize to the altitude before beginning the more strenuous parts of the tour. Depending on your arrival time, you will visit the ruins of Saqsaywaman, the museum of Koricancha and other notable parts of the historical city center, where you can see a mixture of colonial and Inca architecture. We leave Cusco at around 6:30 am and drive for approx. 50 minutes to the town of Chinchero. Here we will visit the Inca ruins as well as a small seventeenth-century church. We will also participate in an interesting, approx. 20 minute, lesson on the textiles that are prepared by the local women of Chinchero. These wonderful women will explain how they make colors from the local plants, how they dye the wool, and how they process the wool from alpaca and sheep. After that, we will continue driving for about 45 minutes before we reach the start of our gorgeous trail to the Sacred Valley of the Incas. We will begin the trek at around 11:00 am. Most of the trail we follow this day takes us along original paths used by citizens of the Inca Empire; this makes it a great crowd-free alternative to the mainstream Inca Trail. 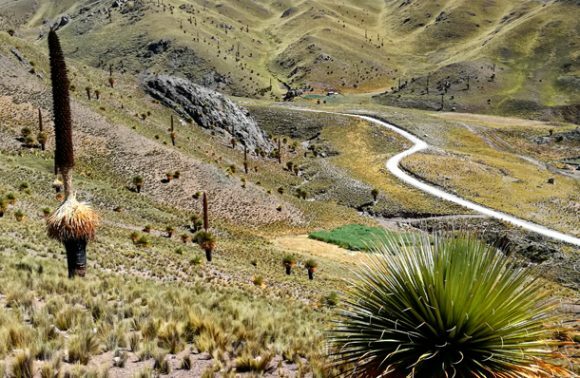 We will pass rarely-visited Inca ruins at Huchuy Qosqo before reaching a viewpoint from which we will have a beautiful vista of the Sacred Valley spread out below us. Hiking down from this point, we will reach the small village of Lares where we will spend the night. Lares is a beautiful town, home to some natural hot springs where you will have the chance to freshen up the next morning! Today is a long day of trekking, and we can expect to reach Lares at 8:00 pm. NOTE: Today´s trail is a little bit more difficult, especially the last part which involves a 1-1.5 hour steep downhill hike. You will not need to carry much with you except for your water and snacks in a small day pack. All other items will be brought by us for you to the Sacred Valley at the end of the trek. Today, our trek takes us through very different landscapes and communities than those we will have already experienced! 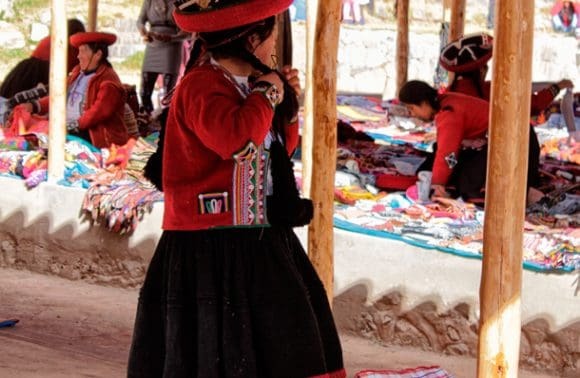 En route from Lares to Patacancha Valley we can expect to see charming Andean communities, locals dressed in traditional, bright fabrics, as well as herds of llamas and beautiful scenery. Upon arrival in Patacancha, you will meet the family who will be hosting you for the night. Andean hospitality is special, and you will be invited to join the family for a traditional meal. On Day 4, our trek is much shorter, but no less spectacular! We will depart Patacancha Valley at 8:30 am (or earlier, if you would like to spend more time in local hot springs) and travel 45 minutes by car to the trailhead. 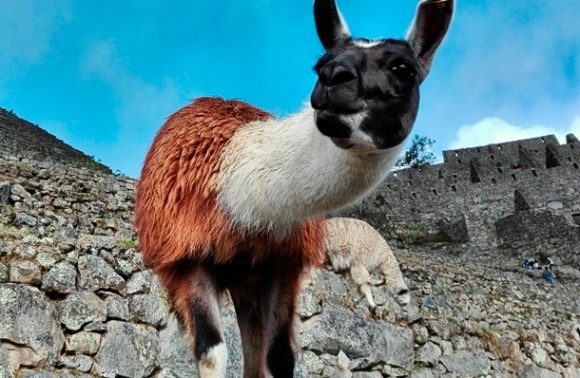 During our trek we will pass pre-inca ruins at Pumamarca before reaching the beautiufl town of Ollantaytambo – a real gem of the Sacred Valley – where we will spend time exploring Inca relics with a guided tour. The fifth day sees us trekking through the high jungle, experiencing a completely different climate and landscape, demonstrating just how diverse Peru really is! We leave Ollantaytambo at 5:30 am and drive by private car for about. 4 hours before we begin our trek. Finally, on the sixth day of our adventure in the Inca Jungle, you are presented with the opportunity to explore one of the New 7 Wonders of the World, Machu Picchu. Surrounded by mountains and jungle, you will have the opportunity to enjoy this incredible place from the early morning until 5:00 pm (closing time). You will start the journey to Machu Picchu from Aguas Calientes where you will take an early morning bus to the site´s entrance (with this option, an additional fee for the bus ticket is required) or you will walk there (around a 1-1.5 hour trek). 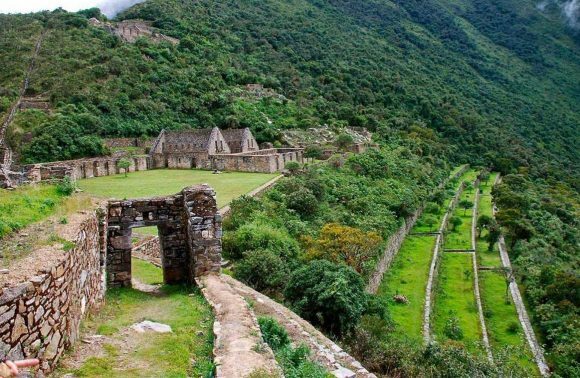 In the ruins, you will have a 2 hour guided tour, giving you an overview of the history and culture of the Inca Empire, as well as the spiritual, political and educational importance of Machu Picchu. 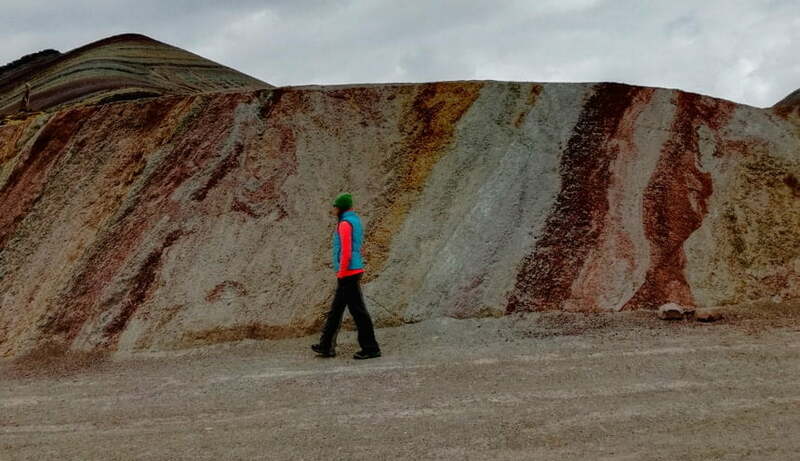 After the tour you will have time to explore the site on your own until about 5:00 pm (you also have the option to leave earlier if you wish). Inside the ruins there are multiple options available to you: You can hike one of the two small peaks, Huayna Picchu or Machu Picchu Mountain, you can even walk to the Sun Gate (Inti Punku) and/or Inca bridge. 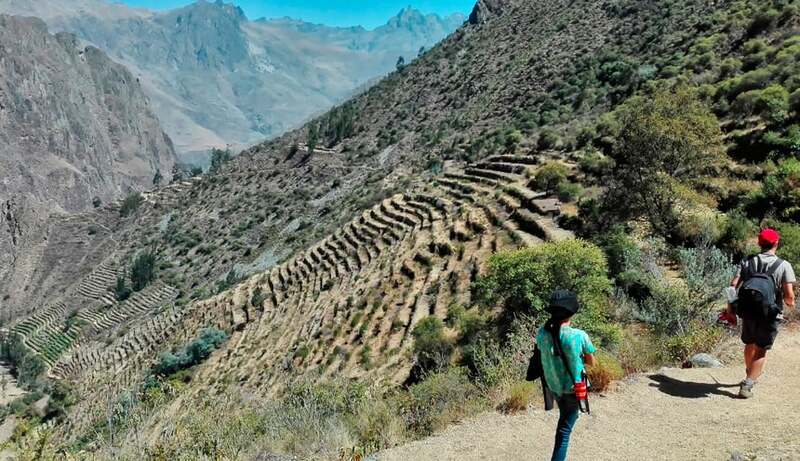 You will make your own way back to Aguas Calientes via bus (with this option, an additional fee for the bus ticket is required) or on foot (around a 1 – 1.5 hour trek), from where you will take a train to Ollantaytambo. In Ollantaytambo, our bus will be waiting to transfer you back to Cusco, where you will arrive at around 10:30 pm. Leaving at 4:45 am, we will travel by private car for approx. 4 hours to the region of Ausangate where we will start our one-day trek to Ausangate´s 7 lakes. On the road, we will stop for a Peruvian breakfast served on the street! 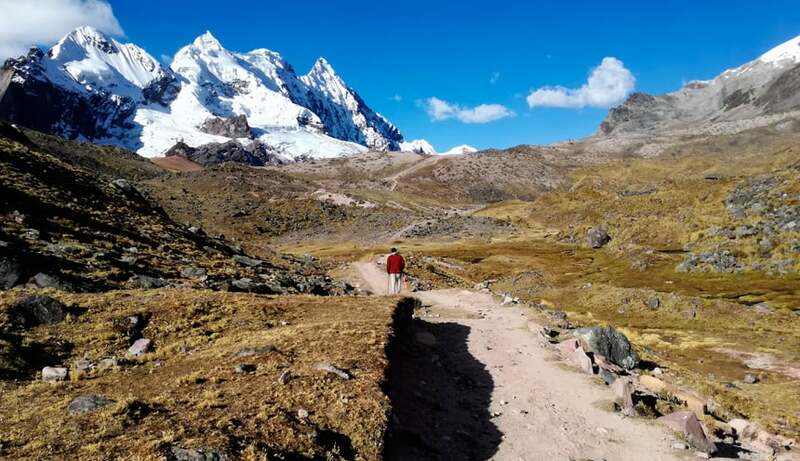 The trek takes around 8-9 hours through the spectacular Ausangate region where you will encounter herds of alpaca and incredible views of snow-capped peaks, including Mount Ausangate – the highest peak in the Cusco region. At this point we will be at an altitude of 15910 ft (4850 m) – the highest point of our trek! Today´s lunch will be enjoyed on one of the most impressive parts of the trail, where we will have amazing views of the peaks of the Cordillera Vilcanota. Finishing the trek at around 5:30 pm, we will be collected by our private car and driven a further 4 hours to Cusco, where we will arrive at approx. 9:00 pm. 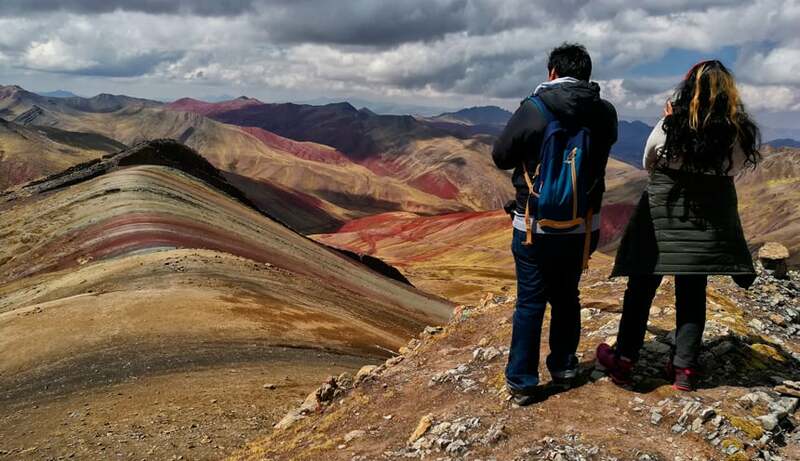 Today takes us to the incredibly beautiful Rainbow Mountain, after departing our hostel at 7:00 am. The trek to the mountain is tough, but beautiful, and takes us up to an impressive 16400 ft (5000 m) above sea level! At this point, you will be fully acclimatized to the altitude and should be able to relax and enjoy the fantastic views. Our private transport will take us back to Cusco in the evening, where you will have time to relax in your hotel or explore Cusco´s nightlife. Day of leisure in Cusco. Depending on your departure time from Cusco you may have time to visit more of the city´s sites, browse the artesian markets or even stop for a very traditional lunch at the Mercado San Pedro! Your tour “Trek Peru: 9 Day Adventure” will end this day in Cusco. If you would like to stay in the Cusco region or Peru longer and explore more, feel free to contact us. We are happy to modify our tours so that they meet your tastes and expectations.